I once wrapped my entire body in cling wrap for a school dress-up day, and nearly fainted. Sammy J! I gave myself this nickname in high school and it appears to have stuck. Being forced to catch a ball in public. Eager. To. Entertain. My. Readers. Wally from Where’s Wally. He gets to visit every country in the world and doesn’t have to worry about what clothes to wear. 1999, so I could tell myself not to shave my hair off. I was 16 years old and thought it would be a funny thing to do on New Year’s Eve. It wasn’t. I spent the first month of the new millennium hiding in my bedroom and begging my hair to grow back. I was a very quiet boy when I started school and spent a lot of time reading on my own. Then in Grade 3 I started writing stories about my classmates in order to make them laugh. I’ve been making up stories ever since. Blimp. It’s short, it’s fun to say and it floats through the sky like a giant marshmallow. The phone book. So I could call everyone and ask them to bring me more books. Sammy J (aka Sam Jonathan McMillan) first tried to get a book published when he was 11 years old, but received 17 rejection letters. He then passed the time writing comedy songs, making TV shows, and touring the world as a comedian. Then he wrote another book – and this time, it got published. His live shows have taken him from Edinburgh to Montreal and collected multiple awards along the way. As a composer, he has written music for stage and screen. His TV work includes Sammy J & Randy in Ricketts Lane and Playground Politics, and he can currently be seen on ABC TV performing weekly satirical sketches. 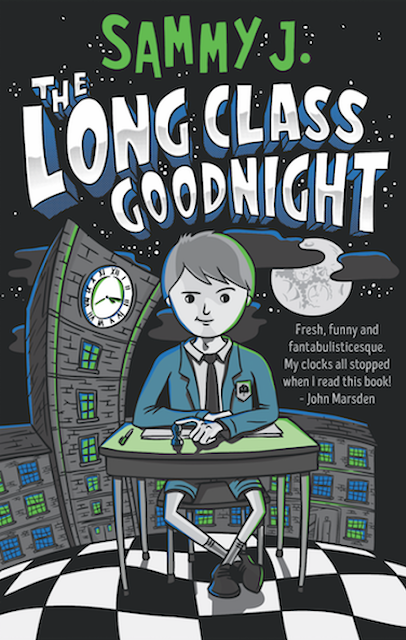 The Long Class Goodnight is his first book. For more information, see www.sammy-j.com. What a fun interview. Loved it!